I’m not giving the poor rating to the movie as it is a wonderful Eddie Murphy comedy vehicle, but instead it’s due to a lazy re-release. Plot Synopsis: Prince Akeem (EDDIE MURPHY) is the prince of a wealthy African country and wants for nothing, except a wife who will love him in spite of his title. To escape an arranged marriage, Akeem flees to America accompanied by his persnickety sidekick, Semmi (ARSENIO HALL), to find his queen. Disguised as a foreign student working in fast food, he romances Lisa (SHARI HEADLEY), but struggles with revealing his true identity to her and his marital intentions to his king father (JAMES EARL JONES). 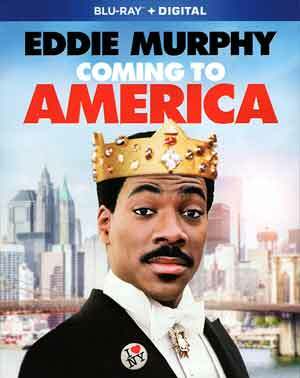 Quick Hit Review: I’m not as crazy as a fan of Coming to America compared to most but still found it incredibly funny and showcases (or reminds) why Eddie Murphy was so damn good back in the 1980s. The jokes mostly land and the chemistry between not only Murphy and Shari Headley but Murphy and Hall as best friends, was what really made the film work. The only thing I probably didn’t care for was when Murphy was playing multiple characters, not sure why but took me out of an otherwise good movie. This (re)-release comes with a semi-glossy slip cover and inside is a Digital HD redemption code. Prince-ipal Photography: The Coming Together of America (24:39; SD) – This is a decent enough featurette with interviews and behind-the-scenes footage. Fit for Akeem: The Costumes of Coming to America (18:05; SD) looks at the lavish costumes created. Composing America: The Musical Talents of Nil Rodgers (11:09; HD) is an interview with the composer and how he approached creating the score. A Vintage Sit-Down with Eddie and Arsenio (5:39; SD) is merely an old interview between the two actors. Coming to America is presented with a 1080p high-definition transfer and with a 1.78 widescreen aspect ratio (MPEG-4 AVC codec). Like Trading Spaces and Plans Trains and Automobiles, this is the old picture originally released years ago; as such it’s adequate but not exactly sharp in detail while colors looked fine. The Dolby Digital 5.1 track is included on the disc and sounds perfectly satisfactory outputting good dialogue and some okay ambient noises via the surrounding speakers. Overall, I’m not giving the poor rating to the movie as it is a wonderful Eddie Murphy comedy vehicle, but instead it’s due to a lazy re-release where the only new things are cover artwork/slip cover and a Digital Copy code. I guess if you didn’t already own this, and with the cheap $14.99 SRP, might be worth picking up for <$10, otherwise skip.